Srinagar, Nov 09 (KNS): Asserting that her Party has a greater role in reaching out to people in these critical times, PDP President and former Chief Minister, Mehbooba Mufti today asked her Party workers to sense this responsibility and reach out to people to get them out of present critical times. Chairing a meeting of the office bearers of Dooru and Tangmarg Assembly constituencies here today, Mehbooba Mufti asked her Party workers to reach out to people and help them in the redressal of their grievances. She regretted that virtually there seems to be an administrative onslaught on people with no accountability being fixed anywhere in the official system. “The recent snowfall in the Valley is a case example. With few inches of snow entire administrative machinery evaporated from the scene as if there were no advance arrangements made. People suffered immensely, particularly the horticulture”, she said while asking her workers to come to the rescue of common masses and help them in coming out of these tough times. She sought an adequate package for the horticulturists whose orchards got damaged by the recent snowfall. 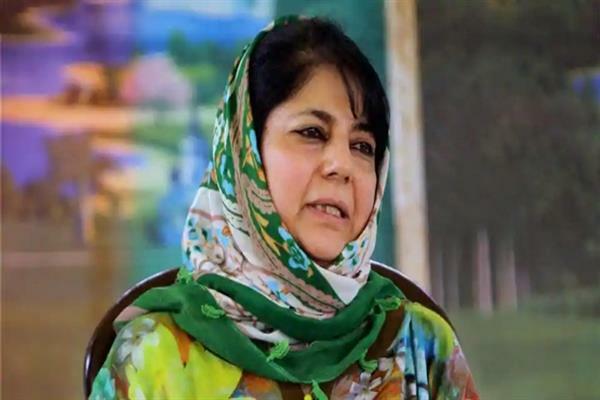 Mehbooba Mufti said her Party would continue to pursue the agenda of people’s welfare to let Jammu & Kashmir usher into days of progress and development.